Under some circumstances, an injury to the head or the brain can be immediately apparent. In other instances, the injury may be so subtle that elusive symptoms may not manifest themselves until weeks or months later. 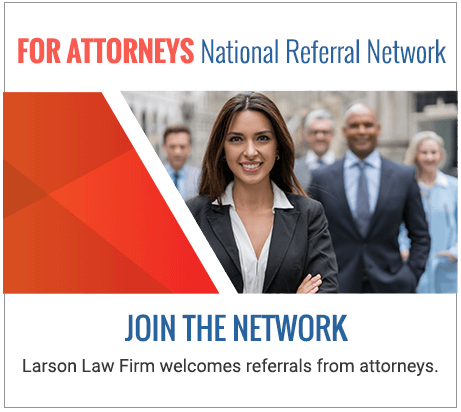 At Larson Law Firm P.C., our reputable North Dakota brain injury lawyers pursue financial compensation for accident victims who have suffered head and brain trauma. We understand the significant impact that a traumatic brain injury (TBI) can have on a victim. That is why we diligently seek a compensation amount that adequately aids with your recovery and helps you move forward with your life. Regardless of how a traumatic brain injury occurred, we work closely with you and your family members to determine the short- and long-term needs of the injured person. We have extensive experience negotiating fair and just settlements with insurance companies and any liable parties to the accident. However, should a settlement prove unlikely, our skilled litigators aggressively pursue your claim in a court of law. The brain is a complex organ that medical professionals know relatively little about. Thus, symptoms of head trauma are not always immediately apparent. Some injuries, like a foreign object projecting into the skull, present with serious symptoms immediately. Other brain injuries, like a concussion or bruising of the brain, may not present signs of impairment for weeks or months after an accident. Because many of these effects are permanent, brain trauma is often described as a catastrophic injury. Even if the severity of a brain injury is not immediately apparent, these incidents can result in serious mental impairment. If you are experiencing blurred vision, headaches, a ringing in the ears or a loss of balance, it is important to seek medical attention, even if an accident may have occurred months ago. An attentive loved one can make a world of difference when a brain injury occurs. If, following an accident, you notice a loved one is having trouble with language, reasoning, decision-making abilities or has experienced a change in personality, he or she may have a brain injury. After seeking medical attention, you should seek legal advice from a knowledgeable lawyer to explore your options under the law. If you or a loved one has suffered head trauma in an accident, get experienced legal representation from the skilled team at the Larson Law Firm P.C. We primarily work from our convenient office location in Minot, where we also diligently serve the residents of Ward, Williams, McKenzie, Pierce and Mountrail Counties with their personal injury needs. Call 701-484-HURT or complete our contact form to schedule a free initial consultation to discuss your case.